Counselling where anger is present. New Online Anger Course with Court approved certificate for $298. Anger Management Courses in Melbourne, held over four sessions using new techniques and with court certificates issued. Relationship counselling for couples in conflict. Also for those wanting to enter into a new relationship. Personal Counselling for anxiety, depression, low self-worth and addictions, where anger is present. Anger Management Online Course. With court certificate $298. Cognitive Principle Matrix. Teaches principles and how to achieve higher level needs. This program is based on Polyvagal theory in Therapy, a book which was released for the first time in 2018. Since the private practice started in 2010 , over 1220 clients have been councelled and 650 letters to the courts on behalf of clients. Both the Anger Management Course was completely revised based on polyvagal theory in 2018..
First golden rule: When it is positive it is personal, that is it is given personally and received personally. However, when it is negative it is behavioral. It is about the problem not the person, otherwise anger can arise. Second Golden rule: When negative thinking goes up, then principles go down.When principles go up, negative thinking goes down. Eg. When you angry and abuse me, I think negatively about you and my respect for you goes down. Result: We give trust, respect , acceptance and commitment to every client. CONTROL in every transaction: Achieving /working towards a goal or in trying. ENGAGEMENT in every transaction: Unconditional giving of trust, respect, acceptance and commitment. MEANING in every transaction: Seeing growth in self, others and causes. The 4 basic emotions in life and their purpose applied to life’s boundaries. Rules, boundaries and consequences are formed around four relationship principles and four influencing principles. Understand what life balance means related to the 4 basic emotions and why seeking a work/life balance is not effective. Spiritual principles are used to transcend your human nature. The 7 main spiritual principles which enable you to rise through Maslow’s 7 levels of needs. Your predictive system and comparative system work and how to use those to rise to Maslow’s highest level of transcendence or self-actualisation. Understanding how dysfunction [negative and personal] arises and how it keeps you at Maslow’s two lowest levels and prevents optimum flow. Understanding the 7 stages of attachment/detachment and how to use those to develop awareness and improve relationships. Understanding how the conscious and subconscious mind creates negative [bad] habits using polyvagal theory. Change bad habits by not working on them, but by creating good habits and attaching those to the bad habit using polyvagal theory. Stop using logic and positive thinking to change a bad habit. Integrate IQ, EQ & SQ and move into optimum performance. When to change from having a goal to having hope. Counselling uses all of the above elements to treat anger, anxiety, depression, low self-esteem, addictions and relationship issues. 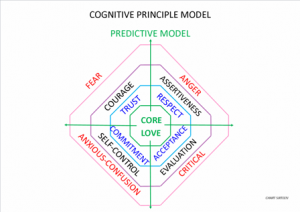 Is to improve life by using The Cognitive Principle Matrix, which is based on changing thinking, understanding and developing principles, and applying those using innovative techniques. The inside-outside matrix. It starts with love. To continue to make the CPM simpler to understand, learn and use. To provide wider applications for the CPM. To provide the latest developments in anger management.